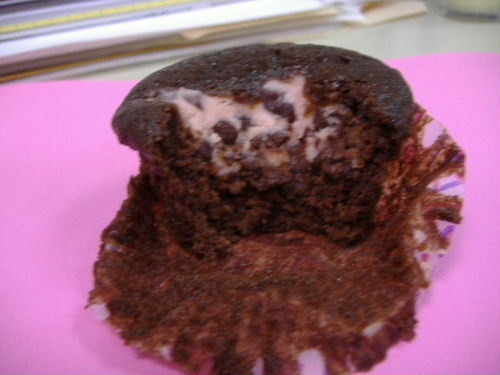 This is a cream cheese chocolate chip cupcake. It appeared because I wished it. No kidding. My sister was telling me the other day that I have to stop at the Magnolia Bakery in NYC next weekend and get one of their cupcakes. It's near the apartment. She said people stand in line for them. Ever since then, I have not been able to get cupcakes out of my mind. All day yesterday I was thinking... where can I get a good cupcake??? The supermarket ones are yucky and we don't really have a little bakery anywhere near here. I thought about actually baking them but I didn't have time. So I was pretty much convinced that I wasn't going to get a cupcake. That is until the nice girls at Wells Fargo Home Mortgage showed up here this morning with a little Valentines Day goodie basket. How did they know?? It's amazing. Tomorrow I'm going to wish for about 350 yards of cashmere worsted weight.... preferably tan in color. I can't wait to see what happens!! Wow! I think you should spend the day tomorrow thinking that I should win the lottery!